This is our custom-built Mogami 3103 12AWG speaker cable with overall (round) jacket. 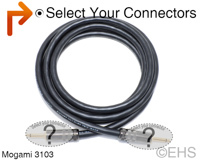 Construction is Mogami 3103 12 GA speaker cable. It is a heavy-duty ultra durable overall jacked cable, with oxygen free copper conductors and has great flexibility. These are amazing sounding speaker cables and are perfect for studio or live applications. Pick the connectors you need: Bare (un-terminated), 1/4", Banana, Speakon, Fork and EP. Photo 1 shows 10' cable with 1/4" gold connectors. Photo 2 shows one option for the two ends with 1/4" gold connectors.